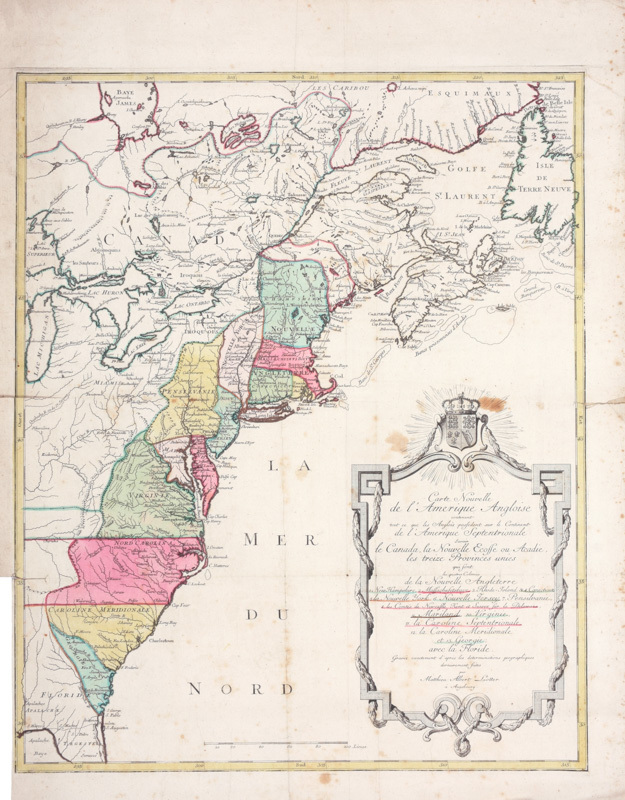 Note: This map was issued shortly before the outbreak of the American Revolution and was included in Lotter's Atlas Geographique, Seutter's Grosser Atlas, and composite atlases throughout the conflict. The map covers the region from James Bay through Newfoundland in the north and to the northern part of Florida in the south. It reflects German interests in America with numerous cities and towns, forts, trails, Indian villages, and tribal territories. The colonial borders are quite inaccurate, as is common with a number of German maps of the period. The large and ornate cartouche incorporates the British coat of arms and names the thirteen colonies.